Another excellent mystery from Ann Granger. Fran Varady is a great character - never too predictable. Who: At least 15 BookCrossers. Great mystery, complicated and the devil is in the details. Picked up at meetup. Enjoyed this very much, although I really wonder how she manages. Fran spends more than I would suspect she can afford and MS Granger only remembers it periodically and adds things like the terrible bottle of cheap wine. I like her attitude to the people around her and I like Ganesh', too. If they spend enough time together the two attitudes should rub off, blend, even out or whatever. A good thing. I liked the fact that Edna doesn't have a sudden revelation and lose her dementia. Taking this to meetup. Join us 6:30 to 8:30 for lots of laughter, book exchanging and fun. If no one takes this it will probably be in the entryway. This looks good and it will be great for my bones bookbox. I liked this one, and I've picked up another in this series by the same author. This book is now on its way to jumpingin, who chose it out of The Suspenseful Summer VBB. Enjoy! Thanks, loveamystery. This looks great. You always have the best books! Once again Bookcrossers have introduced me to a great series. 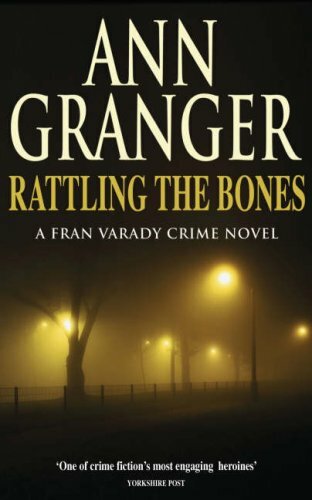 I'll be looking for more Fran Varady mysteries! 4thEstate has chosen this from bookstogive's mystery VBB. I'll be sending it along as soon as I have an address. On its way to 4thEstate by surface mail. Book crossed the border and arrived in the mail today - thanks, jumpingin! Tucked away on the bookshelf in the fifth-floor dining area.